E6000 Adhesives are industrial strength, multi-purpose, and dry permanent and clear. 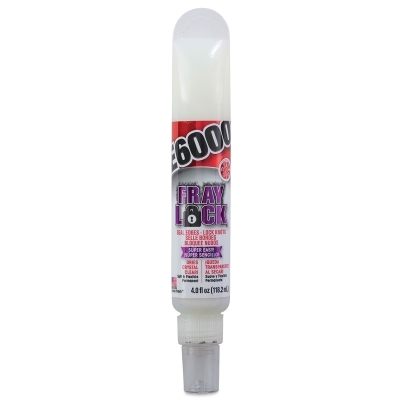 E6000 offers a wide range of adhesives for a variety of uses — Precision Tip Adhesive, Mini Tubes, Jewelry & Bead, Shoe Dazzle, Fabri-Fuse, and Fray Lock. Delicate knots and fraying fabrics have met their match. Fray Lock permanently bonds raw edges and seals knots. Soft and flexible, use it for quilting, embroidery, sewing, and more. Fray Lock is washable and acid-free. ® E6000 is a registered trademark.